Writer’s block is a creative’s worst nightmare. However, Holly Sellors (aka Project Lumino) turned her frustration of not being able to pen new music into a different, and unexpected, career footpath. She talks to Hanna about her artistic success and how you can unleash your creative side. Who/what are your artistic inspirations? Have you always been particularly artistic? I think my inspiration is more to do with wanting to achieve something. Growing up, I was a B-grade student. I wouldn’t fail at anything, but I was never the best. When I started to paint and got good reactions from people, it encouraged me to do more. Making other people smile is something I love to do, and it was really inspirational knowing I could do that with my art. I’ve always enjoyed being creative; I would always make people birthday cards. I also enjoyed learning to draw my favourite cartoons. In my early teens, I was really into anime. This has helped me in terms of the portrait and figure workshops I have taught. However, I never really stood out as an artist until a couple of years. It has taken some people by surprise! Much of your work features animals – are you as much of an animal lover as your work suggests? I absolutely love animals! I’m a keen photographer and am in my element when I am at a zoo or a farm spending time with animals and taking photographs. I like to visit these places on my own as I will spend a long time at each enclosure. Landscapes were the first thing I began painting, because I live in such a beautiful part of the world, surrounded by the English countryside. But I found it stressful, as I would never get the picture to look how I wanted it to. One day I decided to paint a seagull after a trip to Brighton. I dropped all worries about trying to get it perfect and just enjoyed doing it. That is where my simplistic style came from. At the time, all I had was a palette of 12 colours, which encouraged me to experiment with colour. 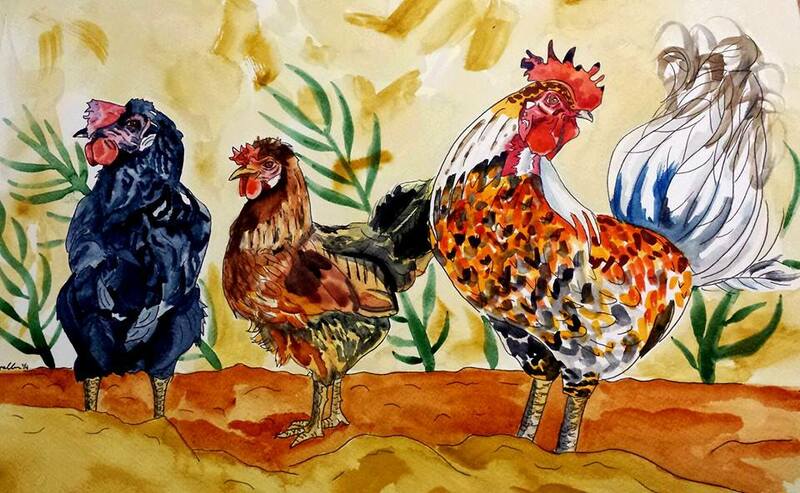 I started to develop a style, and the more I practised, the easier it was to draw animals. I’ve never looked back! What advice would you give people who want to pursue an artistic career? Practise, for a start. My first attempts at drawing animals weren’t that good and would take hours – now I can very quickly sketch an outline. It is all about learning proportions and paying attention to the basic shapes that make up the animal. I paint from photographs that I’ve taken, so I spend time before putting pencil to paper, judging where to start and what shapes I see. I draw almost every day, and it really does pay off. Secondly, take any opportunity that is given to you. I joined an art club in 2011, and that is when I started to put on exhibitions. I would get group emails asking for artists to take part in exhibitions, and I would email back straight away expressing an interest. After that, it all started to snowball. Through that I meet other artists, who pass on more opportunities, and exhibitions often happen annually, so I’ll continue to take part each year. Lastly, don’t stress! Art is meant to be fun. Do what you want to do. I never went to art school or had lessons, and I like that because it means I’ve developed at my own pace, in my own style. If I go wrong I can usually fix it, and if I can’t, I don’t worry about it because it’s all a part of learning. Do you get artistic block, or is that just a myth? One of the reasons I started painting was due to the artistic block I experienced with my music – I was a musician for several years before painting, and I produced my own music under the name of ‘Project Lumino’. One day I sat at my keyboard and just couldn’t write a song. I’m not sure why. In the end though, it turned me to painting, and it made me find what I was meant to do. I’ll usually get artistic block when I can’t find a photograph I’d like to draw. When this happens, I will usually plan to visit a farm or a zoo to get more material. However, since using Twitter, I haven’t ran out of anything, because if I need some inspiration I only have to Tweet, requesting a photograph, and I’ll be sent lots. This has worked so well, and has even got me some commissions! View more of Holly’s work on the Project Lumino website. 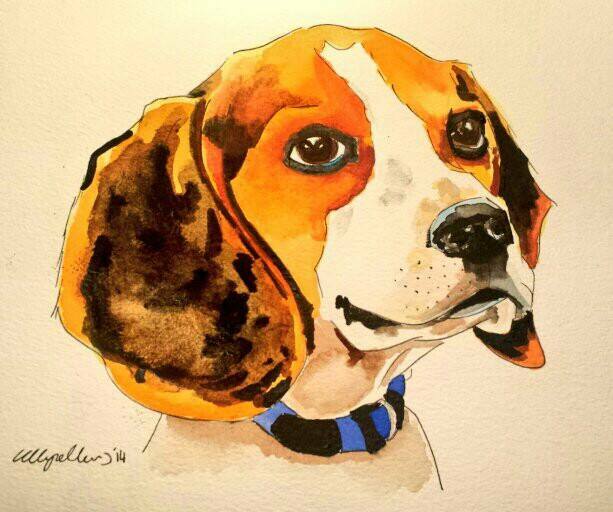 This entry was posted in Creative and tagged animals, art, Holly Sellors, painting, Project Lumino, watercolours. Bookmark the permalink.